Back when I was an honest hustler with more brains than money in the sport that was replacing bowling as America's greatest pastime, I could not resist testing my best game by betting on it. Honest as a Michigan farm implement, with an indomitable backhand, it was the act and then the action of making the bet a win that counted. I refused to take any good person's money. If he was an evil cheater, I doubled the bet. In the same year that I was the best shooter in the ugly sister sport of racquetball, 1973, Bobby Riggs smashed onto magazine covers and into world news by defeating Margaret Court in the Mother's Day Massacre. 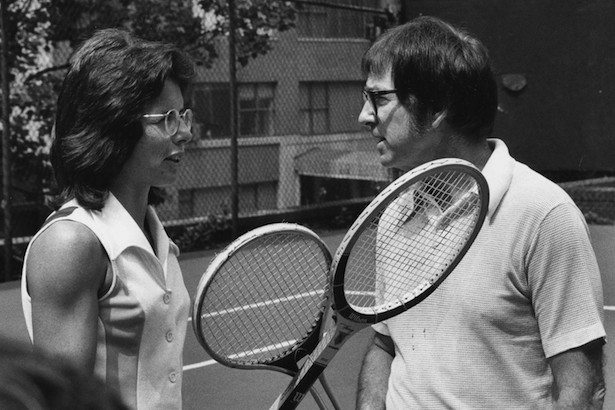 A few months later, slandered the 'fattest sexist pig in history', he stepped up to legendary charming Billie Jean King in the Battle of the Sexes. You only need to know the hustler's mentality to know the outcome. You don't need to read about the mob riding Bobby for a debt, secret locker room conversations overheard by a janitor, or diagnose his supposed ailing 55 yea- old body. Just watch the video of the match and how he jumps blithely over the net after match point to congratulate the winner King. I'm sure that he threw the match because these would have been my thoughts, and were them, when I battled the same year nearly every female racquetball champion informally or in exhibitions playing opposite handed. Bobby said to himself, 'She doesn't stand a chance of beating me, the odds are long against King at 8:5, I'll bet a hundred thousand on myself, and tell my friends to do the same, throw the match, and still be able to get a date! Then with the first match publicity I'll make a million on the rematch.' So, assuredly 30,000 people in the Houston Astrodome and a global audience of a further 50 million watched him throw the match. Riggs was the #1 world player for three years, won Wimbledon, and the U.S. Open. I also threw a few matches rather than take a good woman's money, and then had them treat me to a date after the match. During my 8+ years of investigating all aspects of Paul Haber's life I interviewed a high powered Chicago lawyer that saw Haber give 15+ points and the serve to a Mob family's son who was gifted with a power serve and a good kill shot repertoire. The Chicago mobster got hot and beat Haber in a 21 point game. Haber did not have money to cover the $ bet and they were going to beat him to a pulp or kill him. The lawyer paid Haber's debt to save his life. The attorney said the Chicago mob had a group that just played 4-wall handball within their own group but Haber being Haber got himself in their group that day by placing bets with them and giving points and the serve to start the match. I met Bobby Riggs at the Houston Racquet Club. My group was young wooden racquets Racquetball players. He stood out to a 16 year old Andy Hollan. I played the Juice's driver Al Cowlings at the HRC too. It was jaw dropping in later years to see the Bronco ride with them on a split screen with the Rocket championship game vs. Knicks on the other 1/2 of the screen. The way Haber sometimes worked that hustle was to throw the game and collect a percentage of the debt paid by the party to the mob. No mob family son was going to beat Haber with 15 points if they played all year, but Haber had to let the mob save face, while making his fee. Haber spotted young Chicago Mobster “Big Cy” Abatta 19 points and gave him the first serve at the old Duncan YMCA. Marshall Caifano (a mid-level boss) oversaw the game. Big Cy won, 21-20 and Haber couldn’t cover his bet. Tony “No Boy” Tenerelli intervened, preventing Haber from getting wacked. An unprecedentedly humble Haber excused himself from the scene and lived to to play handball another day. ….read Chapter 16 my book, UNDIAGNOSED, UNSCRUPULOUS AND UNBEATABLE, The Paul Haber Story.